I'm a big fan of Terry Pratchett's Discworld novels, as indicated by a number of the reviews on this blog. But beyond the books, it's interesting to note that a number of them have been adapted into other media, particularly television mini-series. It took me a while to track this particular adaptation down given shows from 1997 aren't exactly all that well-preserved in these significantly digital times. 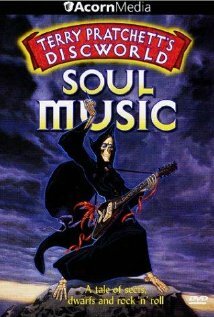 But through the wonders of the internet I was able to secure a copy of the entire mini-series for Soul Music, which is one of my favorite Discworld novels. I guess it goes a long way for me that this is one of the Death-related stories. While the various Discworld novels can be generally enjoyed on their own without having read all the others, the experience is certainly all the better if you have done your homework. And Pratchett has returned to certain character arcs repeatedly over the years, one of the quirkier ones involving the personification of Death and his extended family. And yes, I know it sounds a little strange for a force of nature like Death does in fact have a family to call his own. But that's all part of the charm of Discworld for you. Synopsis: Soul Music is an animated television series based on the Discworld novel of the same name. Originally released in 1997, the series is the first full adaptation of a Discoworld novel. And of course credit as to go to Sir Terry Pratchett for having created these books in the first place along with Jean Flynn, who directed the series. The show, like the book before it, starts with a few major plot threads to start. First, we have young Imp y Celyn (Andy Hockley), a harpist who wants to be one of the greatest musicians on the Disc. On the other hand we have Death (Christopher Lee), who is having some trouble with more regrettable memories of his life and thus is looking for way to forget these things. And lastly we have Susan Sto Helit (Debra Gillett), the orphan daughter of Ysabell and Mort, who had gotten together in the novel Mort. And how these various elements come together is indeed interesting. With Death gone wandering again, it falls to Albert (Bryan Pringle), the Death of Rats to ensure that the cosmos does not fall apart without Death's influence. And given her father, Mort, had once served as Death's apprentice, Susan soon finds herself "inheriting" Death's powers and responsibilities. Meanwhile Imp - nickname Buddy soon forms a band that eventually gets called "The Band With Rocls In". And due to a potentially magical guitar in one of those little shops that appear out of nowhere, there may be more to them than just their ability to play their instruments. The animation style of the entire series reminded me a lot of Flight of Dragons, and yet somehow a little less polished. This does not make it bad in itself - if anything it reminded me a lot of the original Josh Kirby cover art seen in the UK versions of the Discworld novels. And in that sense it lent itself well to the overall sense of whimsy that inevitably comes with Discworld stories. Most of the voice casting was okay - nothing bad but nothing amazing either. But they certainly managed a home run by casting Christopher Lee in the role of Death - a role he would later on assume in the live-action Discworld TV adaptations. His voice just carries with it the appropriate weight and presence to really bring the character to life. And given how important he is in this story, it really, really worked. The voices for the band could have had a bit more impact, I admit. I just wish that Buddy especially really came across as a potential rock superstar. As much as he was under the influence of a supernatural force aligned to Music Itself, I still think he could have had more vocal impact. I will give credit for their decision to sort of expand on the story's musical focus by having the band go through different periods of rock music as well. Each new number depicted a different aspect or period of rock music ranging from the likes of beat music all the way to the Beatles. And this made for an entertaining musical and visual experience. On the whole, Soul Music is a fun little animated series and a nice first attempt to bring such a great Discworld novel to life. It could have been more polished and maybe it could have benefited from a bigger animation budget but on the whole it's still a lot of fun. Thus the series gets 3.5 quirky celebrations of rock music's history out of a possible 5.